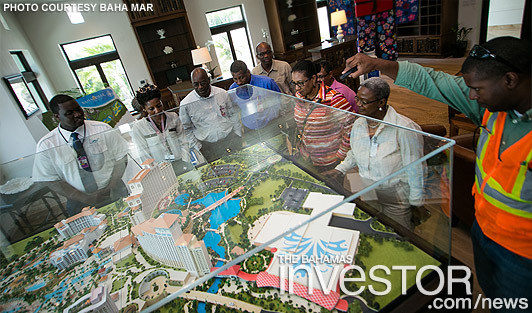 Project Coordinator at Baha Mar Alex Haley showed executives of the Nassau Flight Services VIP Department the layout of the $3.5-billion Baha Mar resort this week. The executives were taken on an in-depth tour of the resort and learned about some of the amenities at Baha Mar. “Visitors to Baha Mar will expect world-class service. It’s up to us to ensure that we provide an experience that makes visitors choose to return to The Bahamas and to stay at Baha Mar. Our industry partners share these goals and, if we continue to work together, I am confident that we can achieve them,” said Baha Mar chief operating officer Paul Pusateri. In December this year, Rosewood Hotels & Resorts is opening its next resort, Rosewood at Baha Mar, set on the white sands of Nassau's Cable Beach. In preparation for the opening, Rosewood has once again teamed up with international luxury travel network, Virtuoso, to ensure the resort opens with luxury travelers eager to stay. Tourism Minister Obie Wilchcombe has won the APEX Award for distinguished service and making an outstanding contribution to the tourism and travel sector. Watch a ZNS Network news report here.